Argyle Feed and Hardware has a great selection of pet foods for our customers in North Texas. We carry dog foods from a number of top brands, including Red Flannel, PMI Nutrition, Infinia, and Exclusive dog foods. Looking for specialty brands? We also carry Black Gold, Taste of the Wild, Diamond, Muenster, Pro-Pack, Nutrena, and Country Dog pet Foods. If you are looking for dog food in North Texas, then you have simply got to come by our store and check out our great variety. We have an expert staff that will be happy to help you find the best food for your dog, since each dog is different. 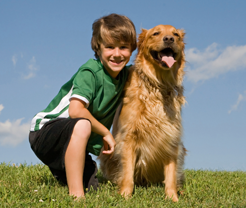 If you would like more information on the dog food in North Texas that we carry, then please click here to view our selection. Here at Argyle Feed and Hardware, we are committed to making sure that you find exactly what you are looking for. If you have any questions about this dog food in North Texas, then please click here to visit our contact page. We will be more than happy to answer any questions you may have.